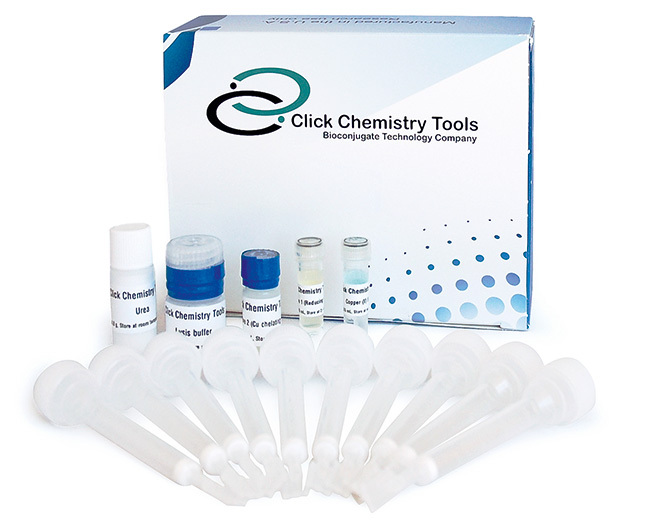 Click-&-Go™ PC Protein Enrichment Kit is an efficient, biotin/streptavidin-free tool for capturing alkyne-tagged biomolecules on a cleavable agarose resin via click reaction and its subsequent selective, reagent-free photorelease. Alkyne-modified proteins, or their post-translationally modified forms, are captured from complex protein extracts on the photocleavable azide agarose resin supplied. Once covalently attached to the resin via copper catalyzed click chemistry, beads can be washed with high stringency virtually eliminating any non-specifically bound proteins. Irradiation with a hand-held UV-Vis lamp yields a highly enriched population of nascent proteins. Captured proteins can be protease digested to yield a highly pure peptide pool that is ideal for mass spectrometry (e.g., LC MS/MS) based analysis. Click-&-Go™ PC Protein Enrichment Kit is an efficient, biotin/streptavidin-free tool for capturing azide-tagged biomolecules on a cleavable agarose resin via click reaction and its subsequent selective, reagent-free photorelease. Azide-modified proteins, or their post-translationally modified forms, are captured from complex protein extracts on the photocleavable alkyne agarose resin supplied. Once covalently attached to the resin via copper catalyzed click chemistry, beads can be washed with high stringency virtually eliminating any non-specifically bound proteins. Irradiation with a hand-held UV-Vis lamp yields a highly enriched population of nascent proteins. Captured proteins can be protease digested to yield a highly pure peptide pool that is ideal for mass spectrometry (e.g., LC MS/MS) based analysis.